What is the high quality content ? - this question found in every blogger mind. Often all the bloggers are very much on the go. Should be a Quality Content or a Post with Quantity. Which of these two should be more important? Many such questions will have come to your mind too. You must have heard that Content is the King, or its content is the King in any article. And this is a fine fit too. But the thing here arises is that only content or quality content. Now the question arises that what is the high quality content? All bloggers should know about it. So let me tell you that this content is not just a blog post that you post in your blog. In reality, this is the information that you submit to Search Engines so that these information can be readily available to those searching on Internet. Quality Content is what Google thinks and decide to share this thing with. This is the real answer to the questions of real people. It is not written for the purpose of a business These are those things which people can read very easily, understand it, entertain them, tell them how things are used, tell them how some things can be found, with it Increase their knowledge with them as well. These are the information that people can use in their lives, which they can share with others, quote them and many more. This is called quality content in the real sense. 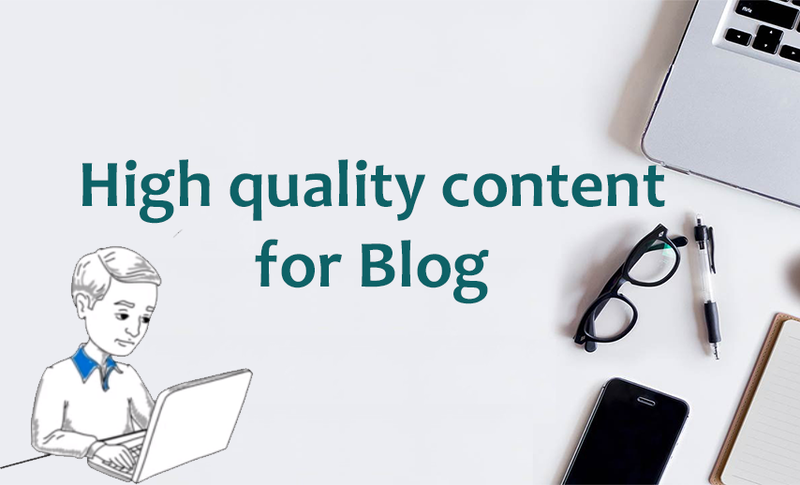 All bloggers like this should create quality content, so that it can be easily ranked in Google and it will be very popular among the people. When it comes to making high quality content, everyone will have to think about a lot of things in a good way. Whether you have a blog or website or a YouTube channel. As to what kind of thing you write content or video (niche), how many people are there in your team, how many people are preparing good content, how long it takes to prepare good content and many such questions. And to create high quality content, you must also know the answers to all these questions, as it can give you an idea of ​​how much content you will be presenting per week. And when it comes to content, then according to me you should create 2 to 3 good content and not 20 to 30 content which does not have any meaning. There are mainly two reasons. Creating Leadership in Market If you have to show your control in the market now, then you should pay very much attention to your content. Your whole contribution in the preparation of your content and should be thoroughly researched. This will bring uniqueness to your content, which will increase both your Market and Leadership Value. Making Brand Reputation Whatever content you create, it increases the reputation of your brand. And you will never want that the reputation of your brand is reduced due to your low quality content, so that your viewers will have a negative impression. Therefore it is very important to do high quality content. The most mucous thing is to bring someone's attention to you. This work becomes even more difficult if you do not have high quality content. I have found some reasons below. Whatever you try but can not make google an owl If you do not have quality content then nobody can save you from Google because Google carefully analyzes all the activities happening on your blog and it will easily know this. Content remains alive for a long time and that too good content, even more. Your old and good content brings more visitors. So to maintain your brand, your quality will also have to be maintained. You have your own Brand Valuation from your content quality. And if you have to keep your leadership instead, then you have to offer better quality content to your competitors. A single high quality content has a great effect on your valuation. And on the basis of this content, you are encouraged to write more good content. It has been found from Reseach that instead of much content, higher quality content has more return value. Which means users prefer higher quality content more than content. The confidence of people with high quality content increases even more so that you get even more chance to get a new business. If you have to keep your fan base or visitors instead, then you have to prepare high quality content regularly so that they fully trust you that they will get the answers to their questions. For this reason, content marketers choose the quality above the quantity. But it is also important to keep in mind that the quantity should not come at the cost of quality (quality). Just increasing the quality, Quantity does not come automatically or naturally. If an article is very good, this does not make much difference if it is not reading anyone. For example, in News Paper and Magazine, they do not increase their customers by writing articles of better quality but increasing their quantity regularly (standard quality). Even if you change your article by sitting in the hours, or if you do not get much articles, or if you do not have much articles in your blog, you will also have a lot of trouble getting a visitor. Therefore, instead of wasting your time in one article, if you write more and more articles, you will have more profits. It is very easy to write, review and publish 12 articles in 500 words instead of a large article of 5000 words. If you pay attention to the slightest quality, then if you focus on quantity, then you can perform very well and people will be very happy with your articles too. If you write very little about the high quality content on any topic, the confidence of the people will be less on you as they will feel that you do not have much knowledge on this subject. Quality is somewhat okay but if you compromise with quantity then you may have to bear too much loss in your business. It has been found from a survey that the company who posted 16 or more blogs per month found more traffic than those who used 4 to 5 blog posts per month. With this it became clear that without writing only the high quality content, everything does not happen, along with quantity is also very important. In today you are going to tell people some tips that you can use to write very good high quality content post. Writing articles is not a big deal, everyone can do it, but you just have to write what your readers like. First of all, let your readers know what they want, answer their questions, read those questions or their comments carefully and know what they want and write them accordingly. It is said that keyword research is the most important thing, it is also right, but you do not need any tools to find it, but you just need to open your eyes, for that you can see in another group or forum. Write down your article according to what people are saying or what they are giving, then they will automatically optimize and your visitors will also get their answer. First increase your trust with your readers and then the business will start automatically. Answer all the questions of readers with the help of your blog post so that they can be trusted more than you, remember that this blog is a way to strengthen your relationship, do business in it and do not waste it. Whenever you are writing an article, keep in mind that you write about some topic around your subject, even after some interval so you can answer your customers' questions very well. The more regular you write the article, the better your post will rank. Along with this you will increase the trust of your viewers who will later prove to be fame for you. If you have to leave your competitors behind, then you have to think a little differently. So that the viewer will come to you as much as they will get something that you want them to do. Be creative and start giving a very high quality content. The method of finding is slowly changing. Such a day will come when we will not have to do some type to find something and just have to talk to our machine and they will understand what we are looking for. Google is also waiting for this day and we should present ourselves for it. I think this is a very simple question, which of us should choose Quality or Quantity? I think the answer is both. It is absolutely wrong that there is no meaning in the article by writing more of it. And also to think that there is not much to read in the article having work and quality, it is also wrong. If seen, both are right in their own place. We just have to understand our viewers to work accordingly. And that's what I have to do to both of them to write good articles and see that you will get the result very soon and that too will be good. I sincerely hope that I gave you complete information about what is Quality Content and hope you guys have understood about High Quality Content. I am convinced of all the readers that you too share this information with your neighbors, relatives, your friends, so that we will be aware of our interactions and will all benefit from it. I need people's support from you so that I can bring you even more new information. How did you feel like writing a comment, so that we too can get a chance to learn something from your thoughts and improve something. "My country is changing now". You also support us in this campaign and contribute to change the country.